This is one of my favorites for a quick, healthy breakfast. 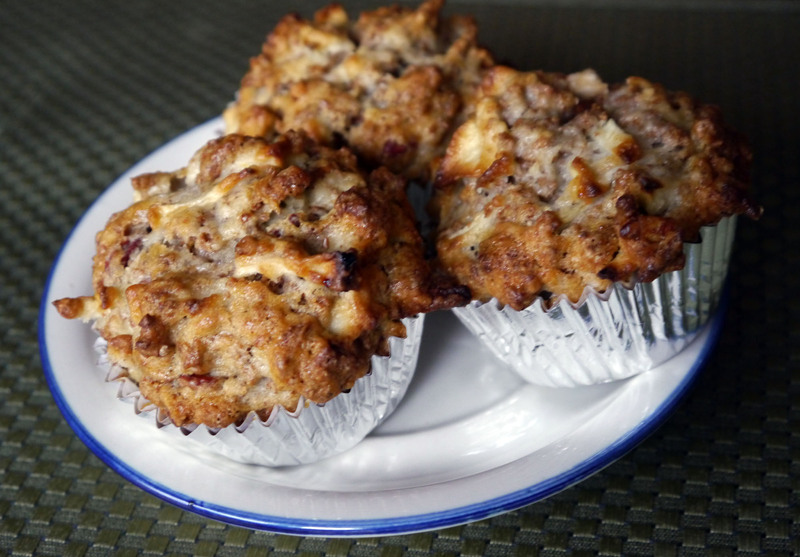 I developed this recipe when the boys were young to try and come up with a muffin that wasn’t loaded with sugar, saturated fat and empty calories. It has reduced sugar, no trans-fat and lots of fiber and all the nutrients from apples and nuts. As with many others, I’ve updated the recipe with Vegan options and have fun testing out these recipes on my Vegan friends. There are probably other Vegan substitutions, but this is the one I have tested. 2 apples – sliced, peeled & chopped. Granny Smith apples are best. Spoon into paper baking cups in a muffin tin. You'll need to heap the batter up over the top of the cups. This is a very stiff batter that seems to be mostly apples, so you will need to heap it up over the top of the cups. This is OK, it will hold it's shape and just raise up a little bit.